Struggling to carry laundry, groceries, and other heavy and cumbersome loads up and down the stairs of your multi-level home can be a thing of the past when you invest in an AmeriGlide Express Dumbwaiter. This practical tool is surprisingly easy to install and will leave you wondering why you waited so long to purchase one! 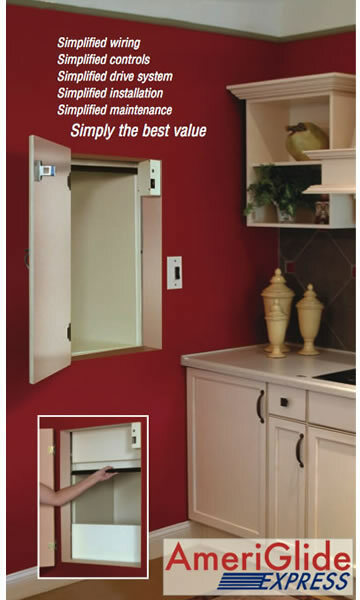 If you have been shopping around for a dumbwaiter, you may be wondering why our competitors’ prices are so much higher. The answer is simple: most dumbwaiters involve complex wiring and intricate pulley systems that require a high level of expertise in order to install. This means more money out of your pocket. AmeriGlide is able to offer the absolute lowest prices available by streamlining the installation process. We pre-assemble as much of the dumbwaiter as possible so that installation is as straightforward as possible, allowing us to pass savings along to our customers. Additional AmeriGlide Express Dumbwaiter features include a 32’ reach, a travel speed of 20 feet/minute, and the ability to make 2, 3, or 4 stops. It is also designed to meet ANSI standards and operate using to low voltage control switches. Give us a call today to get started and start experiencing the convenience of having a dumbwaiter in your home. NOTE: A shaft must be available or constructed in order to use the AmeriGlide Express dumbwaiter. Please consult with a local contractor for more information on shaft construction. We will work with your contractor to provide application drawings customized with dimensions for your specific project. And to facilitate installation and routine maintenance, simply use the temporary plug-in bypass control. Ginny at the beach from Long Beach NY would recommend this to a friend. getting firewood and cases of water etc are no longer a struggle. Betsy from IA would recommend this to a friend. Ameriglide's service was good although there was a delay in getting the technical drawings. The company that did the actual delivery left a lot to be desired. They were 5 hours late in delivery. I think we will consider this purchase money well spent well into the future. Electrician/Carpenter took less than 5 hours to install. Dumbwaiter is very quiet and works exactly as described on website. Retired City Slicker from Morganton, GA would recommend this to a friend. Since joining a wholesale club, it is not unusual to arrive home with 200-300 lbs. of groceries and supplies. Our stairway was daunting. The added bonus is being able to load a day's supply of firewood and transport it from our garage to our dining/kitchen area each day. Unbelievable convenience! The dumbwaiter is makes my life easier. Dan the man from Boca Grande Florida would recommend this to a friend. Joe from Arlington, VA would recommend this to a friend. The dumbwaiter unit functions well and smoothly. It does everything it was designed to do. Our only complaint is that the rough-in design support was not very well managed - and we needed to request design revisions 2x before getting a final rough in plan that would work with the unit. Overall, I would recommend this unit only if installation were to be handled by a competent contractor. This job would be "over the head" of most homeowners. I would recomend your dumbwaiters. Mike Mushaney from Redondo Beach, CA would recommend this to a friend. Easy to install & use. Looks great in any home. Jim from Gore, VA would recommend this to a friend. Easy to install. Complete package. Worked just as described. It Takes two people to move. Delivery process. Dumbwaiter is great. Install was easy, but does require two people of average strength. No more carrying packages up 13 steps.